I think that there are three key theoretical situations which led me to the whole idea of the struggle for recognition. One was reading certain historical investigations into the role of respect in social protests in the proletarian movements of the 1800s. Like the works of E. P. Thompson? You have this interesting notion of the pathologies of reason. Could you tell us what they are, and which ones affect us the most in our time and age? I think that this is a fundamental, constitutive concept for Critical Theory. Its insight is that by means of the structural organization of societies, some of our rational capacities are restricted and others are invited to grow. This is the whole idea behind the notion of instrumental reason. It is a pathology of reason because a certain structure of our society privileges only one dimension of our rationality. I think that it is enormously important for someone in the tradition of the Frankfurt School and Critical Theory to defend that concept, which means to always be interested in how the present structure of our societies privileges and disprivileges certain dimensions of our rationality." Gonçalo Marcelo is a PhD student in philosophy at Universidade Nova de Lisboa, Portugal. See his paper "From Conflict to Conciliation and Back Again: Some Notes in Ricœur's Dialectic" [pdf]. "Etliche seiner Werke sind bereits zu Klassikern geworden – das Buch Bürgerrechte ernstgenommen ebenso wie seine Abhandlungen über Gleichheit, den Wert des Lebens oder die Interpretation des Rechts durch den Richter Herkules. Sein Magnum Opus Gerechtigkeit für Igel konnte Ronald Dworkin vor seinem Tod vollenden; es bündelt sein philosophisches Vermächtnis. Darin greift er den antiken Spruch auf, dass die Füchse viele Dinge kennen, der Igel aber um eine große Sache weiß. Der vielfach preisgekrönte Denker Dworkin war ein Igel, auch wenn er in vielen Hinsichten schnell wie ein Fuchs war. Die eine große Wahrheit, der er sich verpflichtet sah, ist die humanistische Überzeugung, dass wir im Bereich des praktischen Urteilens nicht nur von der Wahrheit geleitet sein müssen, sondern dass diese auch eine einzige, umfassende Wahrheit ist – die von unserer Würde als Menschen. Diese Würde erfordert es von uns als Mitmenschen, andere als Freie und Gleiche zu respektieren, und sie verpflichtet uns als Einzelwesen dazu, aus unserem Leben etwas Erfolgreiches zu machen. Das gute und das gerechte Leben sind Dworkin zufolge eine Einheit, und wer sie – etwa in der Nachfolge Kants – aufspaltet, macht einen Fehler. Den größten Fehler aber machen die vielen sophistischen Füchse, die aus dem nie endenden Streit über das Recht oder die Gerechtigkeit den Schluss ziehen, dass es hier nichts Objektives zu behaupten gibt." See also Rainer Forst's review of the German edition of "Justice For Hedgehogs" here: "Ein moderner Sokrates". "I was Ronnie’s student from 1978 to 1985 and his colleague at New York University since 2006, and I have been in both camps — inspired by his jurisprudence, energized by his conception of law and the rule of law, but unfortunate enough to find myself in disagreement with him on a couple of substantive issues — persistently on the practice of judicial review of legislation and, more recently, on the desirability of hate-speech laws. I always learned a lot from these disagreements. When I was a graduate student at Oxford, I would bring him papers on rights and property and equality, and I would sit in his room at University College, listening to him take my ideas apart. It wasn’t really disagreement at that stage, it was learning — learning what it was like to argue seriously, learning what it meant to be responded to as someone worth arguing with. Everything I have written bears the improving mark of those rigorous sessions. Dworkin also taught me that legal scholarship doesn’t have to be solemn and pedantic. I learned to appreciate and reciprocate the cheerfulness and good humor of my supervisor. I learned how to write gracefully under pressure. I came to understand that it was a privilege to have my papers taken apart and taken seriously." See my links to obituaries for Ronald Dworkin here. "Rethinking Religious Reasons in Public Justification"
"This paper intervenes in the debate on the place of religious arguments in public reason. I advance the debate not by asking whether something called “religious reasons” ought to be invoked in the justification of coercive laws, but by creating a typology of (a) different kinds and modes of religious arguments and, more importantly, (b) different areas of human and social life which coercive laws regulate or about which human political communities deliberate. Religious arguments are of many different kinds, are offered to others in a variety of ways, and the spheres of life about which communities deliberate pose distinct moral question. Turning back to the public reason debate, I argue then that liberals ought to be concerned only about the invocation of a certain subset of religious reasons only in a certain subset of areas of human activity, but also that inclusivist arguments on behalf of religious contributions to public deliberation both fail to explain the moral appeal of religious arguments and fail to justify the use of religious arguments in all areas of public deliberation." Andrew F. March is a Associate Professor of Political Science at Yale University. He is the author of "Islam and Liberal Citizenship: The Search for an Overlapping Consensus" (Oxford University Press, 2009). Many of his papers are available here. Rainer Forst is Professor of Political Theory and Philosophy at Goethe University in Frankfurt, and director of the research cluster on the “Formation of Normative Orders. See one of my previous posts on Rainer Forst here. * Rainer Forst and Rainer Schmalz-Bruns (eds.) - "Political Legitimacy and Democracy in Transnational Perspective" (report, 2011) [pdf]. On March 7, Rainer Forst will give a public lecture at the Erasmus University Rotterdam, titled "Transnational Justice and Democracy: Overcoming Three Dogmas of Political Theory". More information here. Francisco José Contreras (ed.) - "The Threads of Natural Law" (Springer Verlag, 2013). Iván Garzón-Vallejo is Professor at the Faculty of Law and Political Science at the University of La Sabana, Bogota, Colombia. "Ronald Dworkin has died. He was 81. His family said Dworkin died of leukemia in London early Thursday. Dworkin was a professor of law at New York University and emeritus professor at University College London. He was one of the best known and most quoted legal scholars in the United States and also an expert on British law. He articulated the moral idea that the state should act on principle so each member of the community is treated as an equal. A frequent contributor to the New York Review of Books, Dworkin's books included "A Matter of Principle," ''Law's Empire," and "Justice for Hedgehogs." He is survived by his wife Irene Brendel Dworkin, his children Anthony and Jennifer Dworkin and two grandchildren." Paper: "Post-Secularism or Liberal-Democratic Constitutionalism?" "The increasingly fashionable concept and framing of post-secularism aims to construct simplistic dichotomies and clear-cut ruptures between pre-secular, secular and post-secular ages or epochs, in order to paint generalised and homogenised pictures of societies and their inevitable evolution. This conceptual strategy drastically reduces, or even neglects, historical contingency and societal complexity. Against the background of a brief reflection on the possibilities and limits of a transcultural and transhistorical concept of religion, this article engages in a critical discussion of "Secularisation and the Conditions of Post-Secularism" from a sociological point of view and critically reflects on some of the "normative issues of how citizens" of a "post-secular society should understand themselves". In this regard, the main assertion is that we should opt to drop both secularism and post-secularism from our constitutional and legal language, and replace it with priority for liberal democracy or, more specifically, with liberal-democratic constitutionalism." Veit Bader is Professor Emeritus of Social and Political Philosophy and of Sociology, University of Amsterdam. He is the author of "Secularism or Democracy? Associational Governance of Religious Diversity" (Amsterdam University Press, 2008). See his introduction here [pdf]. Paper on "The Human Right to Political Participation"
"In recent developments in political and legal philosophy, there is a tendency to endorse minimalist lists of human rights that do not include a right to political participation. Against such tendencies, I shall argue that the right to political participation, understood as distinct from a right to democracy, should have a place even on minimalist lists. In addition, I shall defend the need to extend the right to political participation to include participation not just in national, but also in international and global governance processes. The argument will be based on a cosmopolitan conception of political legitimacy and on a political conception of human rights that is normatively anchored in legitimacy. The central claim of my paper is that a right to political participation is necessary – but not sufficient – for political legitimacy in the global realm." Fabienne Peter is Associate Professor at the Department of Philosophy, Warwick University. She is the author of "Democratic Legitimacy" (Routledge, 2008). "Brian Barry's justice as impartiality relies upon Thomas Scanlon's contractual device of ‘reasonable rejection’. Many have criticised both Barry and Scanlon for not defining precisely what reasonable is, further suggesting that what is reasonable or rational is culturally specific and cannot underlie a universal account of justice, such as justice as impartiality. In this article I try to uncover the role of rationality, reasons and reasonable agreement in Barry's book Justice as Impartiality, in part by looking back at his first book, Political Argument. I specify in what sense the theory provides a universal account of justice and in what sense it is compatible with weak relativism. I argue that it is a liberal theory in two, very different, senses: first, because of its universalist structure, even though that structure at certain times and places is compatible with what we would now consider as illiberal social justice; second, because it now entails what we see as liberal principles of justice." Keith Dowding is Professor of Political Science at the Australian National University. He is co-editor (with Robert E. Goodin & Carole Pateman) of "Justice and Democracy: Essays for Brian Barry" (Cambridge University Press, 2004). New book: Essays on "Habermas and Religion"
Habermas and Religion presents a series of original and sustained engagements with Habermas's writing on religion in the public sphere, featuring new work and critical reflections from leading philosophers, social and political theorists, and anthropologists. Contributors to the volume respond both to Habermas's ambitious and well-developed philosophical project and to his most recent work on religion. The book closes with an extended response from Habermas. 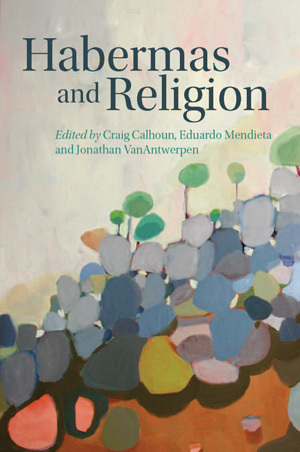 The essays are based on papers presented at a symposium on Habermas's work on religion that was held October 23-24, 2009, at the New York University. Jürgen Habermas's reply is available in German in his most recent book "Nachmetaphysisches Denken II" (Suhrkamp Verlag, 2012) pp. 120-182. Craig Calhoun is Director of the London School of Economics and Political Science. He is the editor of "Habermas and the Public Sphere" (MIT Press, 1993) and the author of "Nations Matter: Culture, History, and the Cosmopolitan Dream" (Routledge, 2007). Eduardo Mendieta is an Associate Professor of Philosophy at SUNY Stony Brook. He is the editor of Habermas's "Religion and Rationality: Essays on Reason, God, and Modernity" (MIT Press, 2002). Jonathan VanAntwerpen is Director of the Program on Religion and the Public Sphere at the Social Science Research Council, New York. See also Eduardo Mendieta's interview with Jürgen Habermas: "A postsecular world society?" (2010) [pdf].